Cassie started at Lovelane in 2007 as an administrative assistant in the program office and became a Lovelane instructor in 2008. 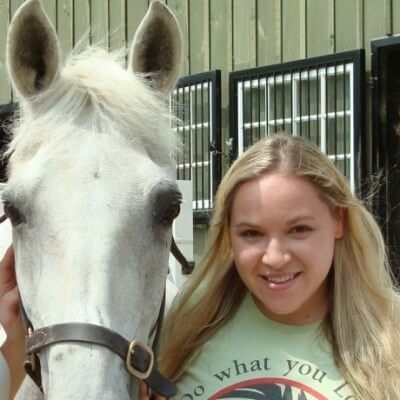 She is a Massachusetts licensed riding instructor and a PATH International certified therapeutic riding instructor. Cassie graduated from Saint Francis Xavier University in Nova Scotia with a bachelor’s degree in History and Spanish. Previously she worked in the Waltham Public School System as a history teacher​ and later as the Coordinator for their Parent Information Center. Cassie has been riding since she was young and enjoys riding at Lovelane whenever she gets the chance. One of her favorite parts about working at Lovelane is that she is able to make a positive impact on the lives of so many unique, young people. She loves getting to know all of her students and is dedicated to being a part of their success in and out of the Lovelane riding arena. Cassie especially enjoys teaching Lovelane’s adjunct programs: Barn Buddies, The ​Perkins School for the Blind summer program​,The​ Cotting School program​ and Horsemanship Workshops.